If you take to the road in the next few weeks, someone's bound to say "make sure you stop for pie." We've all been given a recommendation, and seen those landmark places who advertise their pies on roadside signs for miles. 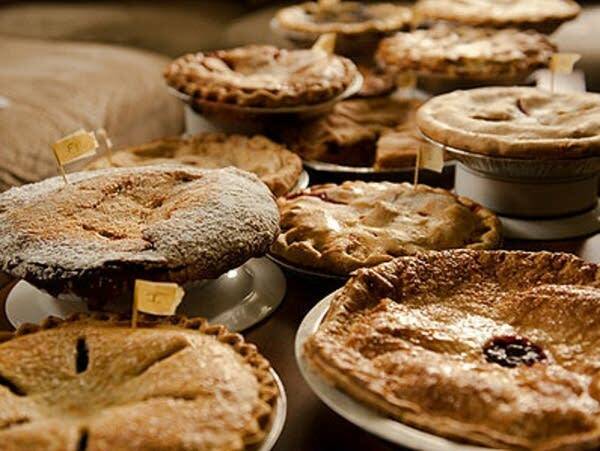 Jim Norton and friends at the Heavy Table blog actually took on the task of tasting some 14 pies this weekend from pie bakeries from around the region, and he joined All Things Considered to talk about the results. We ate 14 pies from as far away as the North Shore and Osseo, WI, in order to figure who's slinging a decent home-style pie in our part of the world. We anonymously purchased pies from 14 local bakeries (including spots on the North Shore, in Stillwater, and in two towns in Wisconsin). Because styles and availability of pies vary wildly, a 14-way apples-to-apples (or raspberry-to-raspberry) comparison was hard to do. But we looked for pies that wrestled with the balance of sweet and tart, and generally found berry and / or rhubarb pies that fit the bill. We all tasted blind; only the organizer (who did not judge) knew which pie was which. Our eight judges rated each pie on crust (0-15), filling (0-15), and overall balance / tastiness (0-20). Total scores varied from 0-50 per pie. We threw out the lowest and highest score for each pie, building an average from the middle six scores.